”With the pupils’ help we will be able to carry out research that would otherwise be impossible to conduct. As far as we are aware, this will be the first and largest survey in the world of young people’s views on the credibility of their own news feeds,” said Thomas Nygren, a researcher at the University of Uppsala. In the “News Evaluator” mass experiment, researchers and pupils will study the type of news in young people’s online news feeds. Using a digital tool, pupils will categorise and evaluate the credibility of the news in a scientific way. By participating in the mass experiment, teachers and pupils will be contributing to innovative research about the dissemination of news in online media, as well as learning how to critically assess sources of information in a scientific way. “Research into source criticism has shown that it is difficult to evaluate news, regardless of whether you are a child, an adult or even a professor. The tool that we are developing teaches how to take a research-based approach to assessing the credibility of news,” said Thomas Nygren, who is collaborating with colleagues at Stanford University in the United States on the project. The tool, which can, for example, be run on a computer or tablet, guides pupils through the assessment process, looking at the provider, the evidence, and what other sources say about the same news. The long-term aim is for the tool to be widely used in teaching and research, both in Sweden and internationally. In the spring, a test version of the tool was piloted by ten classes in Uppsala, Stockholm and Gävle. The RISE Interactive research institute in Stockholm is responsible for the design of the tool. The mass experiment is coordinated by the Swedish non-profit organisation VA (Public & Science) as part of ForskarFredag – the Swedish events during the annual science festival European Researchers’ Night. The aim is to show how exciting research can be, its relevance to our daily lives, and that researchers are ordinary people with extraordinary jobs. Teachers can register their classes to participate in the experiment via the ForskarFredag website. 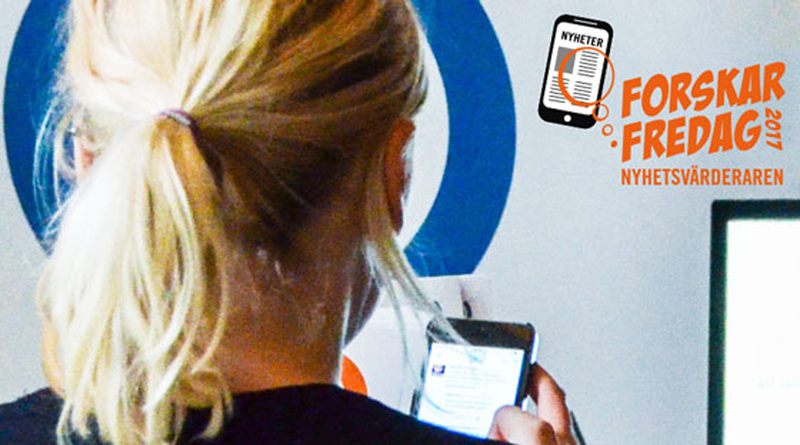 ”The News Evaluator provides young people with an opportunity to learn how to critically review news, as well as to participate in real research together with researchers,” said Lena Söderström, Project Manager of Researchers’ Night in Sweden. This year Researchers’ Night is on 29 September and will be celebrated in 30 Swedish cities: Blekinge, Borås, Dalarna, Eksjö, Falköping, Gävle, Gothenburg, Halland, Huddinge, Jönköping, Kalmar, Karlstad, Lidköping, Luleå, Lund, Malmö, Piteå, Skellefteå, Skövde, Stenstorp, Stenungsund, Stockholm, Sundsvall, Södertälje, Trollhättan, Umeå, Uppsala, Västerås, Öland, Örnsköldsvik and Östersund. For further information contact Fredrik Brounéus, Project & Communications Manager at VA.